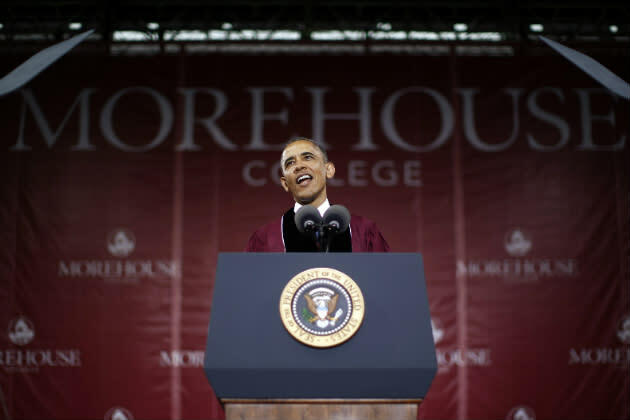 President Barack Obama took a break from the trifecta of controversies—IRS, Department of Justice, Benghazi—swirling around the White House on Sunday to deliver the commencement address at Morehouse College, the historically black, all-male institution in Atlanta. 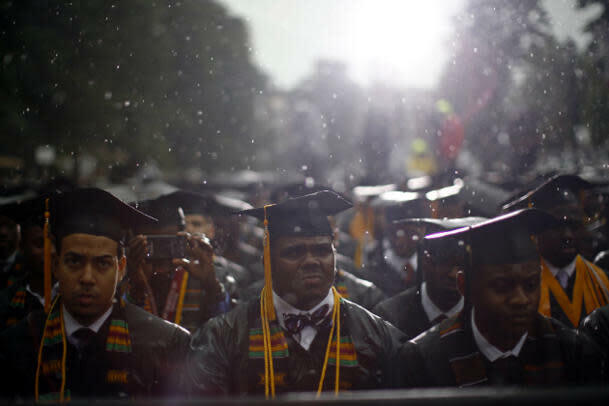 "What I ask of you today is the same thing I ask of every graduating class I address," Obama told 500 graduates and an estimated 10,000 onlookers, most of them in ponchos, on the school's stormy, rain-soaked campus. "Use that power for something larger than yourself." While the message may have been unremarkable, the occasion was historic: Obama became the first sitting president to address Morehouse, the alma mater of Dr. Martin Luther King Jr., whose spirit was evoked throughout the speech. "Many of you know what it’s like to be an outsider, to be marginalized, to feel the sting of discrimination," Obama said. "That’s an experience that so many other Americans share. Hispanic Americans know that feeling when someone asks where they come from or tells them to go back. Gay and lesbian Americans feel it when a stranger passes judgment on their parenting skills or the love they share. Muslim Americans feel it when they’re stared at with suspicion because of their faith. Any woman who knows the injustice of earning less pay for doing the same work—she sure feels it." The president said that while it might be tempting for graduates to use their degrees for personal wealth, they should aim for more. "I know some of you came to Morehouse from communities where life was about keeping your head down and looking out for yourself," Obama said. "Maybe you feel like you escaped, and you can take your degree, get a fancy job and never look back. And don’t get me wrong—with the heavy weight of student loans, with doors open to you that your parents and grandparents could scarcely imagine, no one expects you to take a vow of poverty. "It is not just the African-American community that needs you," Obama said. "The country needs you. The world needs you." According to the Atlanta Journal Constitution, attendees arrived as early 3:30 a.m. to reserve a spot at the open-air ceremony. The president said that growing up, he used to chalk up some of his own "bad choices" to being black. "We know that too many young men in our community continue to make bad choices," Obama said. "Growing up, I made a few myself. And I have to confess, sometimes I wrote off my own failings as just another example of the world trying to keep a black man down. But one of the things you’ve learned over the last four years is that there’s no longer any room for excuses." First-year Morehouse College president John Wilson introduced President Obama. Prior to taking the Morehouse job, Wilson ran the White House's historically black colleges and universities (HBCU) initiative. After the ceremony, the president was scheduled to later attend a fundraiser for the Democratic Senatorial Campaign Committee at the home of Atlanta Falcons owner Arthur Blank. It was Obama's second graduation speech in as many weeks. Last week, the president delivered the commencement address at Ohio State. His third and final speech of graduation season, at the U.S. Naval Academy in Annapolis, Md., is slated for Friday.